Seeing your child suffering from allergies is heart-breaking. His eyes are red and watery, his nose is stuffy and he’s sneezing. You should know that there are different kinds of allergens that can cause allergic reactions: food, dust, pet hair, pollen, etc. In addition, these allergic reactions are not felt with the same intensity for all. Apart from various allergy causes, manifestations are multiple and can occur in several places: on the skin (eczema, rash) in the ears, nose and throat (sinusitis and cough) in the respiratory tract and stomach (colitis, gastritis). If you think your child suffers from allergies that have not yet been diagnosed, take him to a doctor who can confirm the diagnosis and give him a specialized treatment. • Proper housecleaning can help your child. The dust and pollen that comes from the outside of the home undoubtedly contains allergens that can harm your child. Keep windows closed during allergy season. Installing an air conditioning or air filtration system in your home will help. • Avoid planning activities outside during hours of high concentration of pollen. Check the pollen count on the internet or on the weather network. Rainy days are also preferred because pollen tends to stay on the ground, and playing in the puddles is fun, too! • Have your child take a shower and change his clothes after a stay outside to avoid carrying around allergens. • Also avoid drying his clothes outdoors. Use the dryer instead. Always ask your pharmacist which allergy product is best for your child. 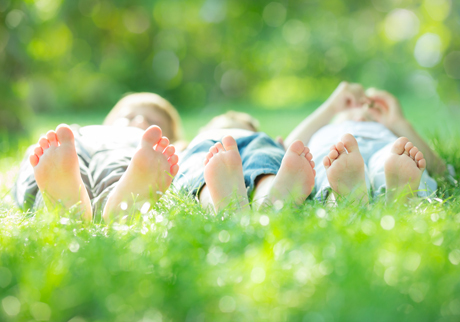 For a natural alternative for children, homeopathic remedies are available at your local pharmacy. Also, it is important to consult a doctor if your child has trouble breathing or has symptoms that seem unusual or disturbing.